We are down to the wire for state testing here in Maryland- less than two weeks. 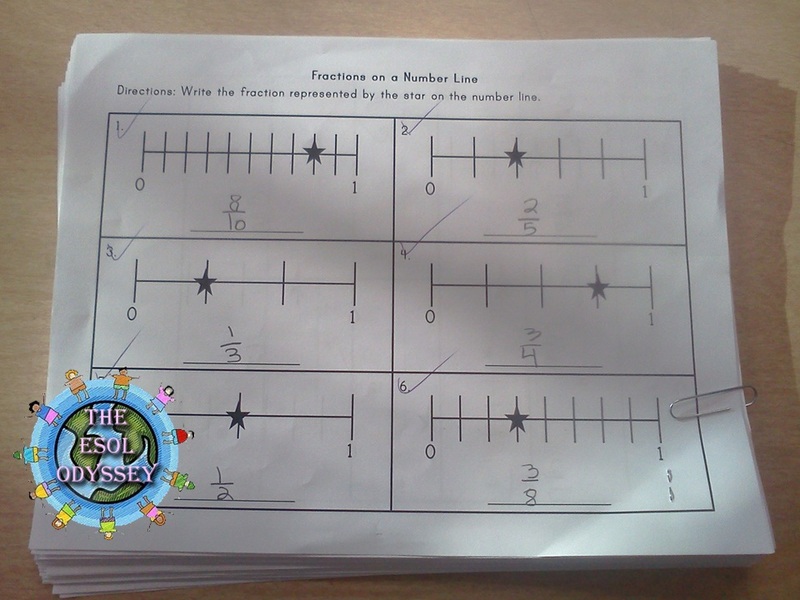 Looking back at the last district benchmark test, one of the areas that my students really struggled with was fractions- fractions on number lines and equivalent fractions, so I really wanted to tackle that with my 4th grade ELLs before the big day. 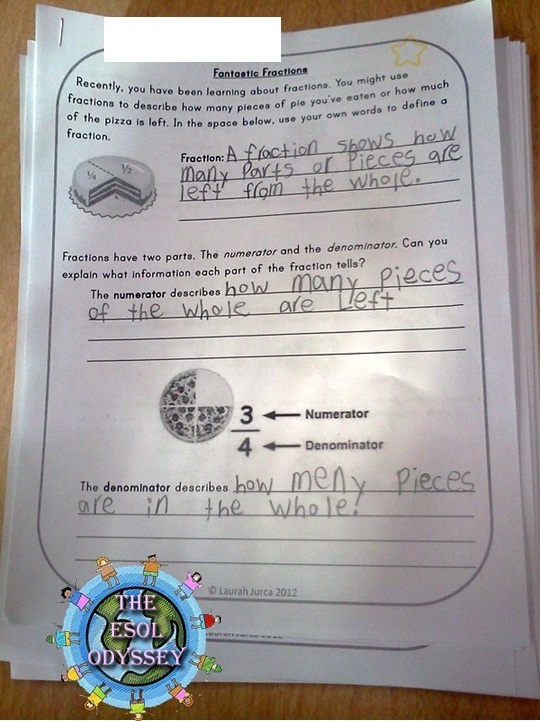 First, we started out last week by writing a definition for fraction, numerator, and denominator. This was a great exercise to introduce students to the academic language that I wanted to hear from them. 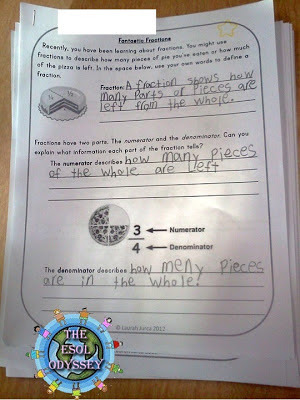 Then, we did an activity where students used information in Valentine-themed word problems to create fractions. We did the first few problems together, and I really modeled the academic language- "How many roses did Selina receive? So, what is our denominator for our fractions? If three of those roses were red, what is our numerator?" Students really caught onto this, and while they worked to solve the rest of the fractions, I heard them using the words numerator and denominator a lot! 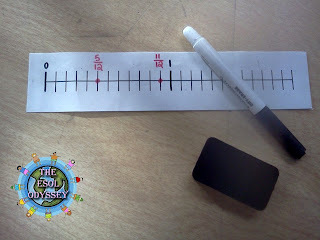 Then, I gave each student a laminated number line, dry erase marker, and napkin. We plotted the fractions we wrote for the word problems on the numberline. Students took turns going up to the board to point out fractions, and then each student plotted on their numberline. When I said it was time to put the numberlines and markers away, one student exclaimed, "But I LOVE doing this!!". 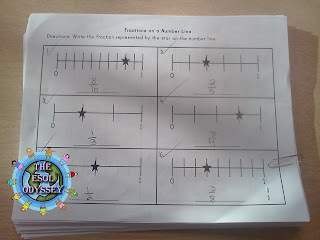 Next, I gave students a worksheet that had fractions plotted on the number lines with a star and asked the students to name the fraction represented. After creating their own number lines and plotting fractions on them, I found that students increased to about a rate of 90% correctness. We had Friday and Monday off, but today we were able to move on to equivalent fractions. I could see that students were really struggling with this, and I wanted to give them a very hands-on, visual way to understand the equivalent fractions. In this lesson, I even had one of my level 1 ELLs participate. This particular student has very little formal education in her home language. She is 11 in 4th grade, and did not start school in her home country of El Salvador until she was 8 (almost 9). 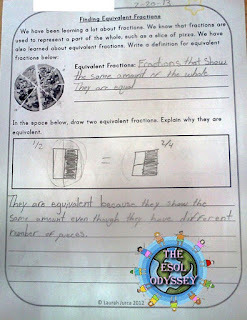 Again, we began by writing a definition for "equivalent fractions". Then, we drew a picture of two equivalent fractions (1/2 and 2/4) and explained in writing why they were equivalent. Next, I showed students the 1/2 and 2/4 equivalent using fraction tiles on the document camera. 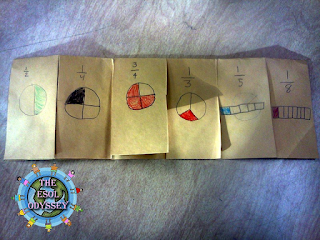 For this activity, I downloaded these FREE fraction strips from Mr. Elementary Math on TpT. I colored each fraction a different color (ie- 1/2= green, 1/4= red, etc). Then I laminated them. His set of fraction strips contains large strips (I like that they are extra large!) and come in whole, 1/2, 1/3, 1/4, 1/5, 1/6, 1/8, 1/10, 1/12 and 1/16. However, instead of leaving them as fraction strips, I cut them all into their individual components so that I had tiles rather than strips. I placed two sets in each bag, and kept one for my use on the document camera. 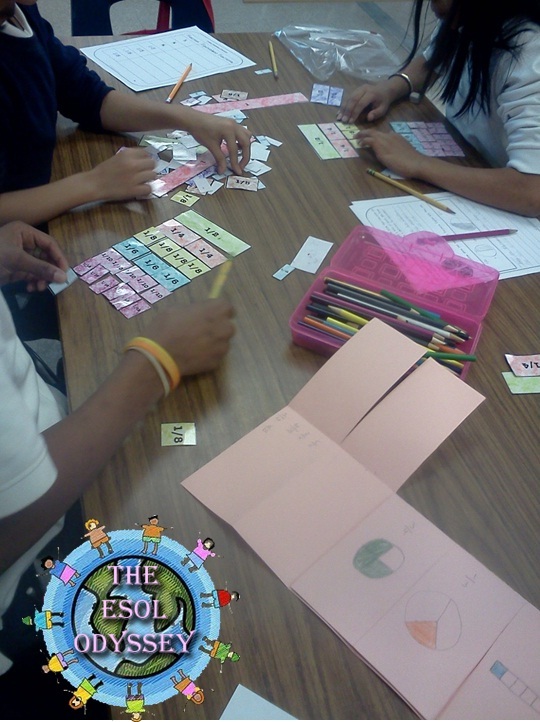 I teach a pull-out ESOL class, so I generally have 6-10 students in my class at a time. For this activity, I had them work in groups of 2-4. 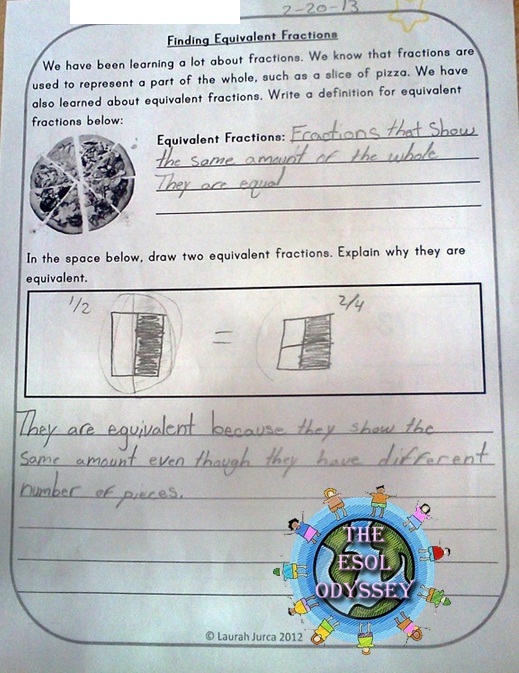 Each student had a chart with common fractions (1/2, 1/4, 1/3, 3/4, 1/5, 1/8). 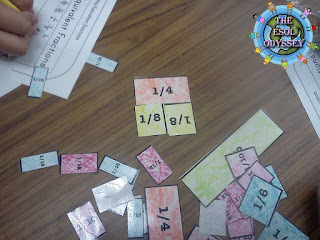 Their mission was to use the fraction tiles to find as many equivalent fractions as possible for each fraction given. Students worked together to use the tiles and discover equivalents, while I walked around and monitored their work. I got to hear excellent discussions and the use of "one fourth" or "one tenth", which is difficult for my students. By the end of the lesson, I even heard my level one say "no, one-third and two-fifths NOT equivalent!" to another student. That made my day! Students also really enjoyed the hands-on and self-guided discovery nature of the activity. It was also interesting to see how different students approached solving the problem. As you can see below, some made a large array of the fractions, and some individually matched each fraction to an equivalent number of smaller fractions. 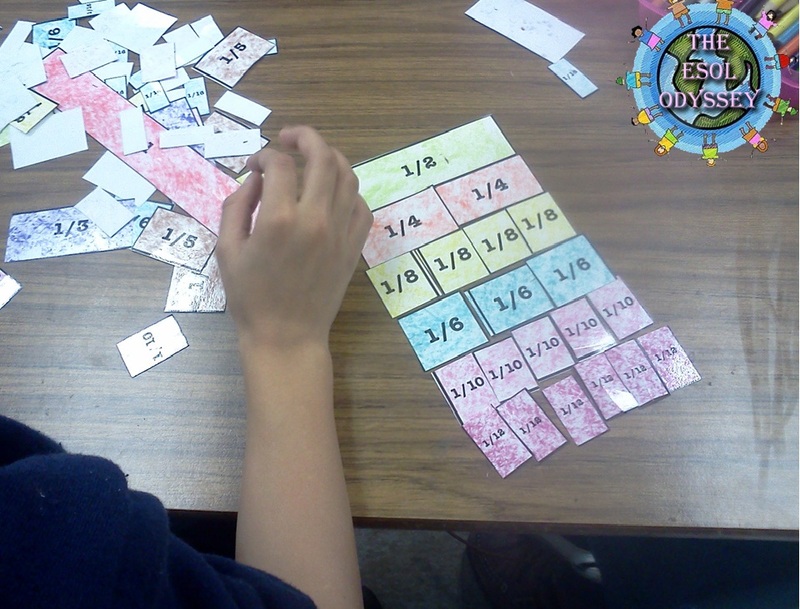 Next, they put the information into a six flap foldable with the fraction and a drawing of the fraction on the outside, and a list of the equivalent fractions on the inside. Students also really enjoyed this activity, and as a result, have a better understanding of equivalent fractions. It was also a great way to keep them engaged and to hear them use the academic language I wanted them to use. If you decide to try this lesson, be sure to use the FREE fraction strips from Mr. Elementary Math and be sure to give him an awesome rating! These fraction strips really made my lesson and saved me a TON of time! I've made everything you need to teach these two lessons, including lesson plans, available in my store at TpT for $5. Both lessons are Common Core Aligned! Just click the button below to purchase! And, don't forget to check out my Augmented Reality Task Cards: Equivalent Fractions! This task cards are an innovative way to include technology in your instruction while helping your students practice the concept and the language! Love all the hands on components of this series of lessons. I can easily see why this was so successful. Great lesson! Thanks. I'm going to use it tomorrow for an observation.